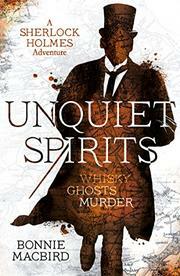 Sherlock Holmes and Dr. John H. Watson tangle with murder, vinicultural sabotage, and reputed ghosts in a Scottish whisky baron’s estate. Holmes, that exemplary man of science, doesn’t believe in ghosts. Neither does Watson, who does believe in the hauntings of memory. Although Watson is very taken by Isla McLaren when she visits Baker Street beseeching Holmes’ help in investigating the mysterious disappearance of parlormaid Fiona Paisley, who was returned to the family estate in Braedern two days later tied in a basket with her hair cut off, Holmes is clearly antagonized by the prospective client’s sharp eye and sharp tongue. Holmes dismisses Isla’s fear that Fiona’s kidnapping and the threatening note that accompanied her return are only the latest of a string of family misfortunes that go back to the killing of her brother Donal in Khartoum and the fate of her mother, Lady Elizabeth, who froze to death after she was accidentally locked out of the manse and now allegedly haunts the East Tower. It’s only after Holmes, sent to the south of France by his brother, Mycroft, to look into charges that British distillers may have deliberately introduced a nasty mite that feasts on French grapevines, is present when the severed head of the once-again-missing maid turns up in a ghoulishly unexpected way that he’s moved to accept the invitation of Sir Robert McLaren. McLaren, the laird of Braedern and Isla’s father-in-law, needs Holmes first to visit his estate and then to investigate a mystery whose tentacles threaten to unspool in every direction imaginable. As in Art in the Blood (2015), MacBird presents a Holmes unusually susceptible to violent emotions and actions, captures Watson’s voice without undue strain, manufactures endless complications, and boldly augments the history of Holmes’ early days, though the sprawling web of crimes and perpetrators inevitably leaves some loose ends dangling. Even readers who shake their heads over the unprecedented fissure that opens between Holmes and Watson will be impressed by the generosity of her plotting and the audacity with which she reimagines Holmes. A superior pastiche which, like the early work of Sena Jeter Naslund and Laurie R. King, is less interested in looking back to 1889, its nominal setting, than in refitting the Great Detective to modern sensibilities.